FAQ, Facts, and other info. Here are answers to some of the more "Frequently Asked Questions", products facts, and other important info. What is the difference between plain brown and antiqued brown? General color questions. Why doesn't the color of my item exactly match what I saw on the web site? Can you make my item white/pink/baby blue (or any other light, pastel color)? Why is there a scuff/scratch/imperfection on my item? Can you make items out of vinyl AKA "pleather"? Do you wholesale or drop ship? For more info on shipping, insurance, privacy, and site use, please visit our Legal Information page. What is the difference between plain brown and antiqued brown? 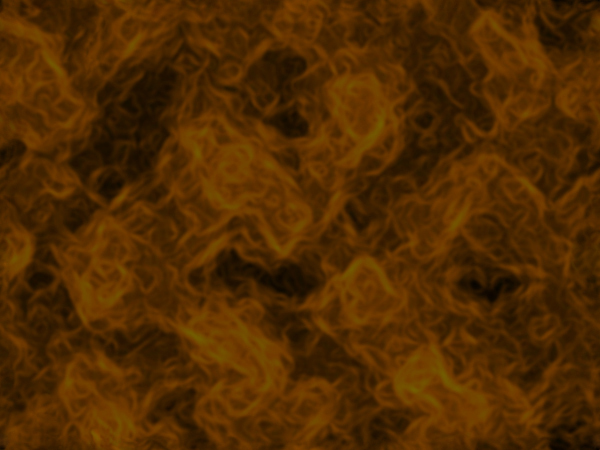 Plain brown is an evenly applied coat of a meduium brown dye. Antiqued brown is the same brown dye with a black fade applied around edges, fold areas, and/or in embossed areas. 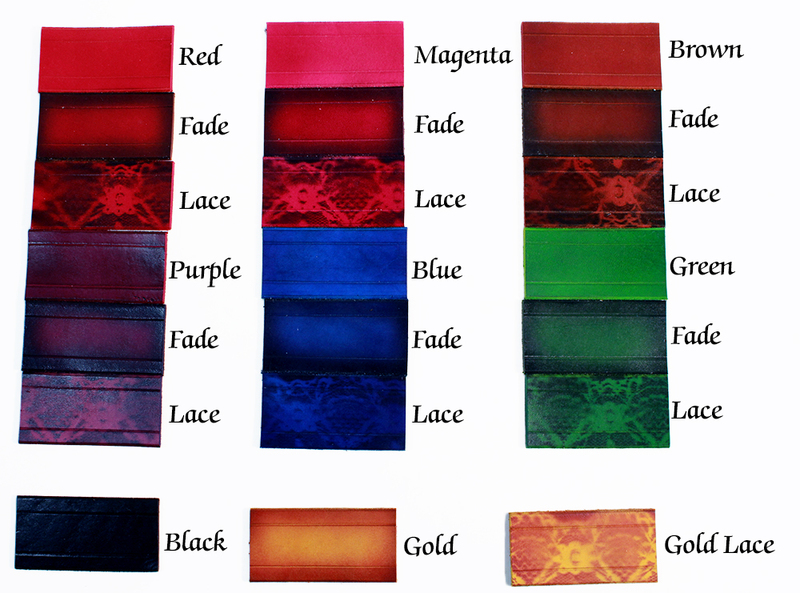 Most colors are now available as a plain solid color or with an antiqued fade. (Garters can also have a lace pattern.) Gold is only available as the 2 tone yellow to brown fade pictured or lace as the yellow dye tends not to hold up well to ageing by itself. Black obvoiusly cannot be antiqued fade or lace pattern. There are 3 main reasons why colors may appear differently in person form the product photos. Firstly, every computer monitor displays color a little bit differently, depending on both model and brand name, and on the users individual color settings. I try to make sure the color displayed on my monitor is as close a possible to the color of the actual item as seen in natural daylight. Secondly is "light source". Colors will look different to everyone depending on what kind and how bright you light is. Blues, greens and purples usually look much darker under an incandescent light bulb, which produces a yellowish light. I use natural daylight as a baseline for taking photos, because it's pretty much the same for everyone. The third reason has to do with the dyeing process. Every piece is hand dyed, and every piece of leather is a little different. Some pieces accept dye more readily than others, and most leather is a light tan in it's raw state. The closer to white it is, the brighter the color. I try to use whiter pieces for bold colors like red, blue, green, etc. and save the darker pieces for browns and black which is affected less by the starting color. If you have concerns, please contact me BEFORE you order. Ummm....sort of. Here's the scoop: everything I make is hand dyed. If you've ever looked for white food coloring, or painted with water colors, you see the dilemma. 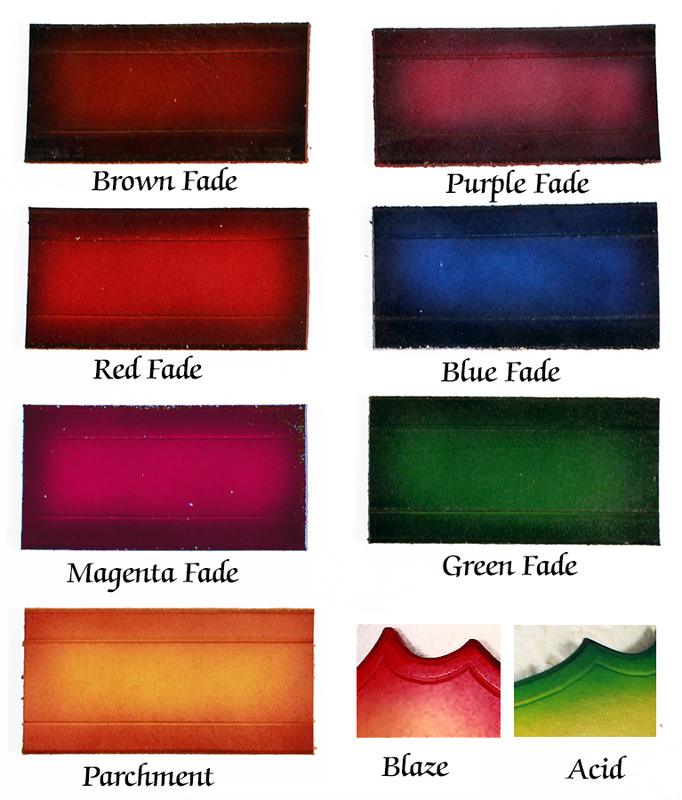 Lighter colors must be achieved by either using less dye or starting with a white background. Since there is a minimum amount of dye that must be applied to get an even and seal able coat, the color depends a lot on the color of the leather I start with....which is NOT white. At best, its a light tan or cream color. Probably not. I have yet to see a real derringer that is small enough to fit in the derringer holster. The cap guns are toys, and are made to fit kid hands, in addition to being partly plastic and much lighter. The holsters I sell either come with the gun they are intended to fit, or are made to fit a specific type of gun. This includes the western holsters and the NERF Maverick holster. They MIGHT fit something else, MAYBE, but it's best to check before you order. I try to explain what types and sizes of gun each holster fits in the descriptions. That said, I DO make custom holsters. I am happy to work with you to create a custom holster made to fit your gun. For a variation on a stock design, it typically adds $15-$25 to the base price depending on material cost and addition labor. For completely new designs or lot's of fancy tooling, brass, or gadgets, the price goes up. Please contact me for details and I am happy to get you a price quote. Hardware refers specifically to buckles, rings, snaps, or rivets. "Silver" or "brass" refers to the color, not the material these items are made from. These are always metal, NEVER plastic. Usually they are steel, but some parts may be cast aluminum, and are coated with either brass or nickel plating. Solid brass is made (mostly) from copper and tin, both of which are very expensive right now as the demand continues to increase. By using plated hardware, I am able to offer products at a much more affordable rate. Just to reiterate, the different bullets I have available on items are all made from REAL components. They DO NOT have any powder or primers, and are inert/non-firing. Furthermore, they are NOT re loadable. They are solid brass or nickel plated, with lead projectiles seated in them(with the exception of the 12Ga. shotgun shells which are paper hulls with spacers inside). They are only for SHOW, and should not be put in any type of weapon. Because they are inert, it is 100% LEGAL to ship these anywhere in the United States. If you are an overseas customer, IT IS YOUR RESPONSIBILITY to check with customs about you local laws BEFORE you attempt to import an item with these bullets on them. Some countries may regulate or ban even ammunition facsimiles. I ship them with (removable) wire inserted into the primer holes to show they are empty, if they are inspected, but that is no guarantee. I have heard of 1 item being siezed in Australia, but several others have gone through fine. If an item is confiscated, most countries have a way to appeal. Be smart and check FIRST please. Leather comes from cows (duh!) which were at one time alive. Their skin can be scratched or scarred just like ours, and it becomes visible when the hair is removed for tanning. I try to avoid using leather with obvious blemishes, but I may include minor imperfections on occasion under certain conditions. If there are minor marks, I try to keep them on the back or inside of the item. It will not effect the durability, or structural quality. I also try to use blemished leather only on items which are meant to look aged anyway, usually finished in antiqued brown. I'll try to avoid getting on a soapbox here about how pleather is usually made from PVC which off gasses toxic fumes. Not to mention it's plastic and not at all good for the environment; unlike good old organic leather. Oops, guess I did get on that soapbox. There are a few people out there who are genuinely allergic to beef/leather, and are looking for an alternative. Most of my items are hand dyed, and are often embossed with designs. Both of these processes require getting the leather in a raw, unfinished state. 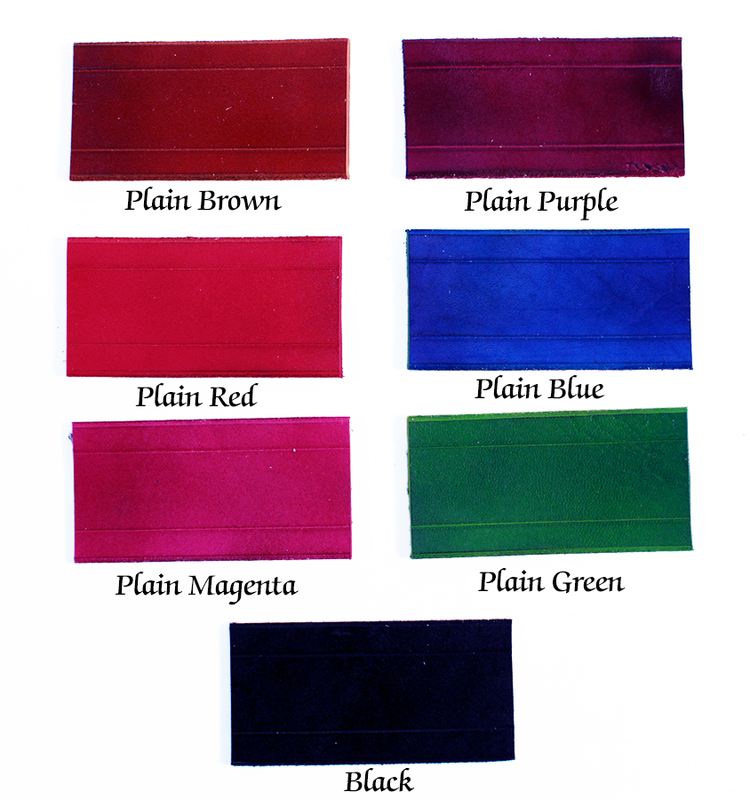 Pleather is manufactured with it color and sometimes texture permanently fixed. I would not be able to dye or stamp it in a way that would replicate my leather goods. In addition, it cannot be wet formed or shaped in the same way real leather can be. I'm sorry, but I'm unable to produce goods of of the same quality level from leather substitutes. Sorry, I don't drop ship. I might consider drop shipping if you have a physical storefront and stocked a selection of my wares in the shop, but how many people out there have a real brick and mortar steampunk shop? I already have a web site to sell my wears, and drop shipping allows other web sites to compete with me using my own goods, taking no risk and doing little work. I'm not a fan of the "middle man". Wholesale is a different matter. I do wholesale to brick and mortar locations, but not to online only businesses. If you have a physical store, please contact me if your interested in wholesale options and pricing. Our minimum opening order is $500 with no minimum restocking orders. Why are your prices so expensive/cheap? Pricing is one of the most difficult things to do as business. You have to balance the costs in materials and labor with what you think people will pay for an item. I have a box full of items I called a "failed prototype" box. They are mostly items that I felt people would not pay the price I would have to charge to cover my labor and materials. I do my best to keep prices fair for both my customers and employees. Most of our goods are hand made in our workshop in Troy, ID. Carrie and I design our own patterns and use historical research and our creativity to make unique and original products. We do carry a few items not made in our workshop, but as a maker, I try only carry products of a quality I would produce myself if I did make them. The boots are made by Oak Tree Farms and are hand made in Mexico (much better than China for outsourcing in my opinion), and are the only leather item made outside the US (though Oak Tree Farms is a US company). The hats are made by American Hat Makers and are hand made and guaranteed by the makers. The Goggles are made by Mac McGowan, owner of Steambaby. We do several shows together but he is not able to travel as far as we are. I've arranged to resale his amazing pieces at shows he is unable to attend. Again, handmade in the US. We stand behind our products, and carry items made by people who stand by theirs. Prices reflect the time and effort spent by individuals working hard to maintain the quality we stand behind. So the question is: How can we sell our goods at such a bargain? Well that depends. Production time will vary depending on the time of year, but you can always check the front page of the website to get current estimates. We try for 3-5 business days unless we're out of town for events, or getting large amounts or orders at once. Often we can ship next day if we have the exact item in stock. Most items we carry in antiqued Brown and brass, or black and silver for sell at events. We can often pull from these stock for orders in a rush. That said, shipping times will vary. We now ship for free to all U.S. addresses. Most everything will ship USPS Priority mail, taking 3 days or less in transit. In order to offer free shipping though, we may sometimes send items USPS First Class due to weight, or (rarely) even by another carrier. If you require specific shipping requirements, please contact us BEFORE you order. International orders are different. Priority Mail International rates have skyrocketed, but I'm willing to arrange less expansive shipping methods. If you would like to purchase an items to be shipped internationally, please arrange shipping options before ordering. Otherwise, the item will be shipped the best method available for the base shipping price displayed during checkout. What is your return policy? If there is an error in your order, please call or e-mail within 30 days of receipt of order to make arrangements for a return. If the error is on our part, we will happily fix the problem to the best of our ability, either through replacing or altering the existing item. Because most of the items on the web site are made to order, returns on standard items due to customer error are subject to a 25% restocking fee. Return shipping fees are the responsibility of the customer. We are unable to accept returns on custom-made products, including any item made to size such as leg/arm garters or belts. Some specialty items such as hats can be exchanged for a different size with approval, but no refunds/returns are accepted.